Before 1978 you were free to walk around inside the stone circle at Stonehenge once you’d paid your admission fee. The lack of any guards overnight meant people also hopped the fence once the site had closed. Stonehenge at dawn. A special access ‘inner circle’ visit at sunrise. After March 1978, everyone was banned from inside the circle – including archaeologists and other researchers, much to their annoyance. Department of the Environment officials said that the plans to allow out-of-hours access to “those with a special interest” had to be abandoned because the custodians were unwilling to work overtime. And so it remained for a long time. Eventually things changed and these days it’s possible to book to go inside the stone circle on what is called a “Stone Circle Access” or “Special Access” visit. These are one-hour long slots before and after the monument is open to the public during the day, and a maximum of 30 people are allowed inside at a time. You can book as an individual, or via a tour company who may (or may not) provide a well-informed guide to show you some of the hidden features that you might otherwise miss. Once inside, if the light’s right you can pick out some of the hundreds of examples of carved initials and names on the stones. One of them might even be that of Christopher Wren – a local lad who made good and went on to design the new St. Paul’s Cathedral after the Great Fire of London in 1666. One thing that a lot of people fail to notice is the sound of the place – there’s a definite sense of entering into an enclosed, peaceful space a soon as you come in through the primary entrance beneath the central lintel of the three on the northeast side of the circle. It’s only when you’re up really close to the monument that the epic scale of the stones really strikes you – the tallest one is over 7m from grass to top, and there’s a further 2.5m in the ground. Weighing in at over 40 tons it’s a beautifully shaped monolith that was part of the tallest trilithon on the site. Sadly its partner upright fell and broke long ago, leaving the lintel they both supported lying on its side in the southwest part of the central area. The bluestones, though much smaller than the sarsens, are still impressive rocks – the tallest one stands leaning in front of the highest sarsen stone and has a wide groove worked all the way down one edge. No-one knows why. There are a few rules – no standing on the stones, no touching them, no smoking – but apart from that you’re free to wander around and properly appreciate both the enormity of the large sarsen blocks, the elegance of the bluestone pillars and the ingenuity of the builders who created the monument over 4,500 years ago. If you have the chance, by far the best way to see Stonehenge is through a Stone Circle Access visit. Stonehenge Guided Tours pioneered these Stonehenge access tours and offer frequent scheduled coach tours at sunrise and sunset. They can often arrange private custom inner circle tours with expert guides. 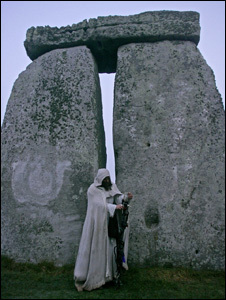 The Stonehenge Travel Company are based in nearby Salisbury and are considered the local Stonehenge experts.